Introducing Tapkee, an efficient command-line tool and C++ library for linear and nonlinear dimensionality reduction. Get 50% off the “Data Science at the Command Line” ebook with code DATA50. 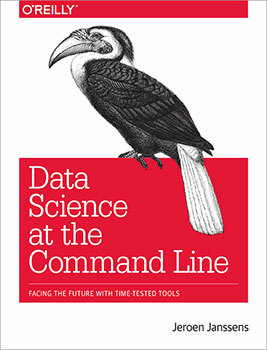 Editor’s Note: This post is a slightly adapted excerpt from Jeroen Janssens’ recent book, “Data Science at the Command Line.” To follow along with the code, and learn more about the various tools, you can install the Data Science Toolbox, a free virtual machine that runs on Microsoft Windows, Mac OS X, and Linux, and has all the command-line tools pre-installed. Buy the ebook with the 50% discount code DATA50. The goal of dimensionality reduction is to map high-dimensional data points onto a lower dimensional space. The challenge is to keep similar data points close together on the lower-dimensional mapping. As we’ll see in the next section, our data set contains 13 features. We’ll stick with two dimensions because that’s straightforward to visualize. Dimensionality reduction is often regarded as being part of the exploring step. It’s useful for when there are too many features for plotting. You could do a scatter plot matrix, but that only shows you two features at a time. It’s also useful as a preprocessing step for other machine-learning algorithms. Most dimensionality reduction algorithms are unsupervised, which means that they don’t employ the labels of the data points in order to construct the lower-dimensional mapping. There is no shortage of news about the importance of data or the career opportunities within data. Yet a discussion of modern data tools can help us understand what the current data evolution is all about, and it can also be used as a guide for those considering stepping into the data space or progressing within it. In our report, 2013 Data Science Salary Survey, we make our own data-driven contribution to the conversation. We collected a survey from attendees of the Strata Conference in New York and Santa Clara, California, about tool usage and salary. Strata attendees span a wide spectrum within the data world: Hadoop experts and business leaders, software developers and analysts. By no means does everyone use data on a “Big” scale, but almost all attendees have some technical aspect to their role. Strata attendees may not represent a random sample of all professionals working with data, but they do represent a broad slice of the population. If there is a bias, it is likely toward the forefront of the data space, with attendees using the newest tools (or being very interested in learning about them). Michael Italia on making use of data collected in health care settings. Michael Italia from Children&apos;s Hospital of Philadelphia discusses the tools and methods his team uses to manage health care data. MetaLayer's Jonathan Gosier on data tools and the data divide. MetaLayer&apos;s Jonathan Gosier talks about the need to democratize data tools because everyone has a big data problem.